Stories like my family's are important not only to give hope to the thousands of less fortunate, but also to defeat harmful stereotypes. Speakers at the "Pathbreakers: The Twentieth Century Muslim Women of India" colloquium. Credit: Laila Tyabji. Coincidentally, a few weeks later, I found myself speaking at Pathbreakers, a colloquium on Indian Muslim women, under a large banner hoarding of my mother, Surayya Tyabji, her gaze gentle but resolute. She would have been astonished to find herself the cover girl for such a conference. She would have been equally astonished to learn that it was because of her role in creating the Indian flag and the national emblem. It was not something she thought about much, just a small part of the stirring, exalting and also sad, scary and traumatic happenings of those action-packed months when India was transforming itself into an independent new nation, but also tearing itself apart. I don’t think she and my father ever publicly claimed creative ownership – the design of the flag was a development of the Congress party tricolour created by Pingali Venkayya and the emblem was inspired by the lions on the Ashoka pillar, a period of Indian aesthetic and history they adored. The chakra they used to replace the spinning wheel on the Congress flag came from the same source. The only time I remember amma referring to it was when she cringed at the distorted colours of Indian flags up and down the country and recalled how carefully, in those pre-Pantone shade-card days, she had specified both the fabric and exact shades. Incidentally, if she had to choose a representative image for herself, it wouldn’t have been that carefully composed picture of an ambassadorial wife that was up in that exhibition. 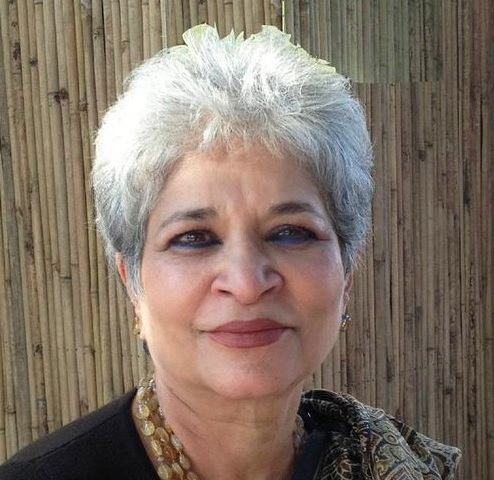 She’d probably have chosen one of her escaping into her own private world of painting or even the one climbing the high rocks of Hyderabad, her sari tucked up to her knees. She was the kind of Muslim woman people don’t talk about, because she didn’t fit either the docile voiceless burkha-clad stereotype or the fiery activist one. My family had plenty of the latter, though mercifully none of the former. But, in her own way, amma was also a pathbreaker. The khandaan she came from comprised the huge, extended clan of Futehallys, Hydaris, Alis, Latifs, Fyzees and Tyabjis – convolutedly inter-related in the best multiple Muslim tradition, all part of the same vast Suleimani Bohra tribe from North Yemen. Liberal, emancipated, proudly Indian – rather unconventional, given the times. Even in the late 19th century, all the women were educated and at least bilingual. Love marriages were the norm, often to similarly brought up cousins. Despite the khandaan’s standing and wealth, they were not in demand as daughters-in-laws. Perhaps, because their outlook and upbringing were so different from more conventional Muslim families. Though different branches of the family prided themselves on their distinctive characteristics, (the hawk-nosed Alis versus the pakoda-nosed Tyabji’s) they agreed utterly on the really important issues. Opting for secular, multi-cultural India, for instance, rather than the monotheistic claustrophobia of Pakistan. 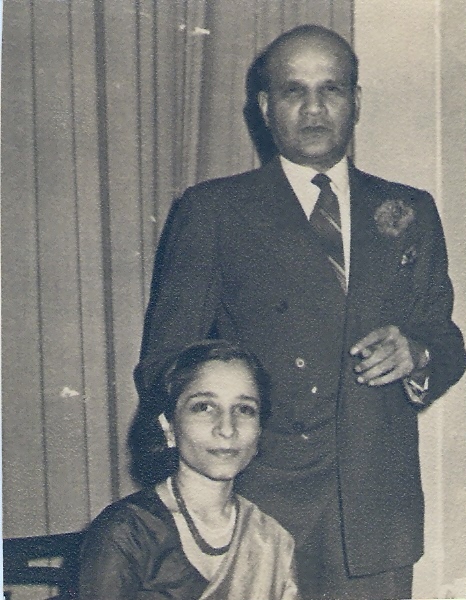 My mother’s branch of the family included ‘bird man’ Salim Ali and the Hamid Alis – he, one of the early Indian civil servants, she, (Sharifa), a redoubtable social worker; both central figures in UP cultural and intellectual circles. My mother’s grandmother was Lady Amena Hydari, who was a pioneer of women’s education during her husband’s tenure initially as finance minister and then prime minister of Hyderabad state. She attended the round table conference in London and actively supported Mahbubia, one of the early schools for both Muslim and Hindu women. Her daughter, my grandmother, Leila Latif, recalls the embarrassment of having to cycle to school, when all the other girls came in tightly enclosed purdah carriages. Those were pre-first world war days. Luckily Sarojini Naidu’s equally liberated daughters, Padmaja and Leela, were allies and friends. People often compared my mother’s fine-boned delicate looks to a Mughal miniature. But she was also brave, resolute and principled. Married to a charismatic forceful personality 11 years her senior, she held her own and became his moral compass, the moving centre of our home. When my parents’ house was attacked and ransacked during the Partition, she sent us children away, but herself refused to leave my father, going off every day to work in the refugee camps at Red Fort. In the 1960s she took it for granted that I, her 22-year-old daughter, set up an independent home in a Delhi barsaati, rode a motorbike and travelled alone all over India. Calmly accepting I was too maverick to get married, she nevertheless urged me to have a child. To her, this was the most creative thing possible. Creative and multi-talented herself, she painted, cooked, sewed and kept an exquisite home, but also rode, swam, managed the family investments and was an excellent shot. She was fiercely and proudly Indian – our homes all over the world used Indian textiles, crafts and artefacts at a time when most people’s aspirations were velvet, cut glass and chandeliers. A rock in times of distress, she was implacable when people transgressed the boundaries of what she felt right. The Emergency ended a friendship with Mrs Gandhi of over three decades. Interestingly, it was my gentle, spiritual mother who eschewed formal religion, my Oxford-educated father who prayed and fasted. Writing this, and looking at my own life, which coincides with the 71 years of Indian independence, I realise my good fortune in not only having my mother, but of being part of this large, liberated, forward looking clan. Working with craftswomen for almost four decades brought home the dichotomy of my life and theirs. So how did I reach Dastkar and the life of a craft-y development lady, providing livelihood options to women all over India? It has been a curious, largely uncharted journey. My life seems created by happenstance. There was no dramatic struggle, no revelation, no renunciation, no mission, not even much drive or direction. Like a kaleidoscope or jigsaw puzzle, little oddly shaped fragments came slowly together to make a pattern. Apparently random, in retrospect they all seem to have a purpose. Coming from a family where for three generations before me, the women had been achievers, there was an unspoken pressure to prove oneself worthy. Politics, social work, government service, education, law, the creative arts, were fields where the Tyabji, Hydari, Latif and Ali women had been pioneers for decades. Our generation were expected to break new boundaries. My cousin-sisters flew planes, ran schools for the deaf, were international badminton champions, behavioural scientists, educationists, artists and eye surgeons. Expectations were high. Our ancestors had arrived in India three centuries ago, landing in Cambay from Yemen in search of religious freedom. The women never wore burkhas, though they covered their heads with lace or embroidery edged chiffon. My great-grandfather Badruddin Tyabji the first, who later became the first Indian chief justice of the Bombay high court and third president of the Indian National Conference, and his brothers, sent all their children to either the UK or Europe to study, including their daughters. There are lovely pictures of them in hats, voluminous Edwardian skirts and leg of mutton sleeves in London, not a burkha or hijab in sight! Returning to India, they readily gave up their elaborate ornamented satin lehenga ordnis for khadi sarees at Gandhi’s call, joining the freedom movement, taking up social and political activism. When I came back from Japan in the late 1960s, none of my great-grand aunts, by then in their 80s, raised an eyebrow at my living alone in a barsaati, not being married, or working. What upset them was my being paid for my job! For them, being privileged implied that one should give ones services to society for free. My last 38 years in Dastkar would have made them happy. Twenty-seven years ago, a young woman killed herself in a Rajasthan village. She doused herself with kerosene and set herself aflame. Although I was living and working only a couple of mud houses away, the drums of a wedding procession tragically prevented us from hearing her screams. By the time we broke open the door, it was too late – Dhapu was dead. She died because she was too poor to provide dowries for her growing daughters and too proud to beg. She felt she had no other choices. Ironically, my organisation Dastakar was in her village, Sherpur, to try and create just such alternatives. A couple of years later, Dhapu’s daughters had become the most sought after brides in the district, carrying the tools of income and earning in their own skilled hands. Stories like this and friendships with Dhapu and others like her brought home once again, how the different circumstances of our lives and birth can shape our destinies. My mother and the other women portrayed in the exhibition of Muslim pathbreakers, mostly came from privileged enlightened, backgrounds. This doesn’t diminish their contribution. But I recall today and must mention, the many anonymous, incredibly gutsy Muslim women I’ve worked with all over India who will probably never have their photographs in an air-conditioned convention centre. We should not forget their courage in stepping out of their burkhas and homes to take on roles and identities so different from their cultural roots and upbringing. The Roshen bens, Sairas, Raeesans, Zahidas in Gujarat, Lucknow, Ranthambhore and Kashmir, who took those first steps braving social prejudice and hostility, marking a path that others could follow. I feel rather foolish for not having had any great struggle to be liberated, feminist and free to make my own choices. I never realised till I was in my 30s how fortunate I was to grow up in this empowered and empowering family, when I saw the struggles other women had to make. Not only did I grow up in a family of strong independent women, their fathers, husbands, brothers and sons were equally supportive partners. They took equality of women for granted. I think it important to share these stories, to give vignettes of hope to the thousands of less fortunate women, but also to change some of the stereotypes of Muslim families. To my mother, grandmothers, great-aunts, aunts and cousins, but also to the men who supported and celebrated them, my thanks. As I was leaving for the colloquium on Muslim women, my goddaughter Urvashi asked where I was going. When I told her, she said, “Why do we have to give people labels and divide them up into communities? I think it’s so unnecessary.” She has a point. Hopefully, as typecasting stops, the relevance of labeling us by communities too will become a thing of the past.